Fill Your Plate - News bites - A tale of Two Farmers: Factory Farm and Family Farm; Which is it? A tale of Two Farmers: Factory Farm and Family Farm; Which is it? There’s a guy in Illinois who’s a farmer. He farms 5,000 acres of corn and soybeans over several areas. He is responsible for all of the business decisions for the operation, including which varieties to plant, when to sell what he harvests and for how much. His tractors and combines are huge machines. They are equipped with laptop computers and the latest GPS technology. As part of his income, he sells seed and cattle equipment to other farmers. He sits on the board of directors for a statewide farm organization, often traveling to meetings and providing input on the operation of county Farm Bureaus in his district. During busy times, he hires outside employees to help get the job done around the farm. There’s another farmer, also from Illinois. As a fifth-generation farmer he takes environmental stewardship seriously, maintaining buffer strips next to water sources on his land. He uses contour planting and no-till farming. He and his kids drink water from the well on his farm. He tends to his animals daily, taking special care when they’re sick. He’s up in the middle of the night—every night—during calving season to check on birthing cows and heifers and their newborns. Hundreds of school kids visit his farm each year for personal tours to understand how their food grows. Three generations of his family work on the farm. How can that be, when everything about the first farmer appears to describe what many believe to be a factory farm? The answer is simple—the term “factory farm” doesn’t mean anything. It’s a term used by activists to make people assume facts not in evidence. They know you’ll hear or read the term and assume it means something bad. But do you know what they mean? Do they mean a farm over a certain size? If so, what is that size? A hundred acres? Five hundred? Is it a farm that raises animals for meat, instead of just milk, eggs and companionship? A farm that plants biotech crops? Is it a farm that makes a certain amount of money? Does it have to be all of the above—or just any one of the above? If you do a Google search for “factory farm” you get about 260,000 results. The first entry, from dictionary.com, defines a factory farm as “a farm in which animals are bred and fattened using modern industrial methods.” Conjures up the image of robots forcing animals to mate on a conveyor belt while they’re being stuffed full of food, doesn’t it? We are blessed in this country to have plenty of food and many options … conventionally-produced food, organic, locally grown. The truth is that no matter the size of the producer or the type of food produced, a profit must be made so that money can be re-invested and the farmer can provide for his or her family. Activists would have you believe that because someone farms a large number of acres or raises a lot of animals, he does a bad job; he endangers the environment and mistreats his animals. Not true. Quality assurance programs, regulations and inspection programs keep farmers accountable. And when someone tells you that America is being over-run by “factory farms,” know that 98 percent of all farms nationwide are owned by farm families. Beware of labels. They can be misleading, vague, even meaningless. Craig Fata is manager of media relations for the Illinois Farm Bureau. This column was originally posted as part of that organization’s Standing Out in the Field blog. Directions: Preheat oven to 350 degrees. Lightly grease a 13 X 9 inch baking dish. 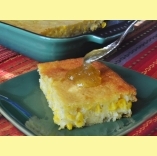 In a medium bowl, combine butter, eggs, corn bread mix, whole and creamed corn and sour cream. Spoon mixture into dish. Bake for approximately 1 hour or until the top is golden brown and toothpick comes up clean.